For this week’s Spotlight, where we highlight one of our own particular favorites among the huge range of Rolex watches we have available through our online store, we’ve chosen something a little special. 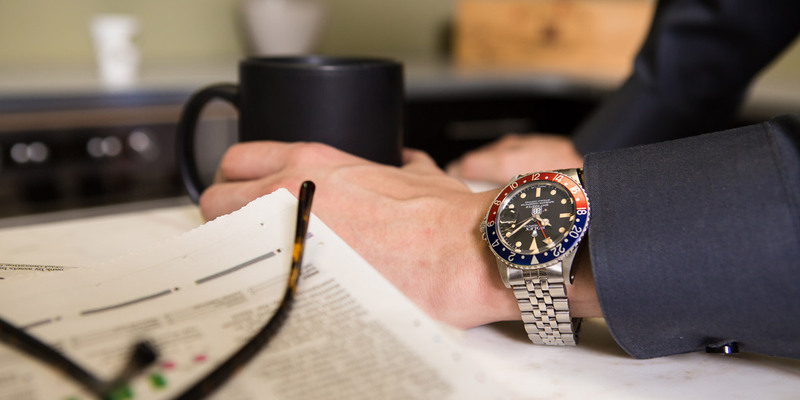 Among vintage watches, the GMT 1675 is one of the most highly sought after watches from Bob’s. The second generation of the brand’s aviation-themed timepiece, the ref. 1675 GMT-Master, had a long and illustrious life. Released in 1959, it served with great distinction all the way up to 1980; a prolific run of more than 20 years that secures it as one of the easier vintage Rolexes to find, and a gateway into the world of classic watch collecting. 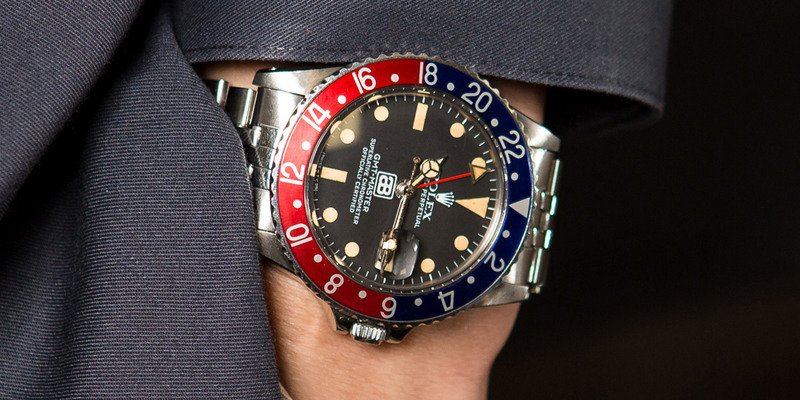 All GMT-Masters, however, are not created equal and the subject we have here is a truly exceptional example. Read on below to learn more about this singular piece. Not all GMT-Master 1675 were created the same way. Way back in the day, the young company of Wilsdorf and Davis, later to become Rolex, made their mark by producing unbranded watches for jewelers to print with their own logo and sell on under their own name. That practice had ceased by the 20s, but as recently as the 1990s, special editions of some of the company’s signature models would bear the names of the likes of Tiffany or Asprey alongside the Rolex moniker, designating the prestigious stores selling those rarefied examples. Similarly, throughout its history, Rolex has made extremely limited numbers of co-branded watches for certain entities, to present as unique gifts or as recognition for noteworthy deeds. The bestowers of these favors range from Middle Eastern royalty to military forces to top professional operations. When French commercial diving specialists Compagnie Maritime d’Expertises collaborated with Rolex on the Sea-Dweller, the resulting watches presented to their elite group of divers each had the legend COMEX imprinted on the dial, making them something of a grail watch among collectors. But together with these specialized examples, several high profile retail businesses have also graced their top performers and most loyal employees with Rolex watches emblazoned with their company logo. Supermarket giant Winn-Dixie is one example, and of course, who can forget the infamous Domino’s Pizza Air-King presented to store managers grossing $25,000 a week for four consecutive weeks? Other Co-Branded dials include Tiffany and Co., Comex, and Dominos Pizza. Ironically, considering the subject of this week’s Spotlight, Coca-Cola rewarded executives with 25-years’ service with co-branded pieces of their own. Obviously, the unusual dials distinguish these particular watches, giving them a real sense of exclusivity and a corresponding premium in price. And the one we have here at Bob’s is an especially fine example. Our privately labeled 1675 is one of the last of the series, emerging in 1979. The first of the GMT-Master references to feature a crown guard, the early pointed, or El Cornino, features have made way for the more rounded guards of later years. Likewise, it has the red 24-hour hand, topped with the large triangle, that is correct for the era. 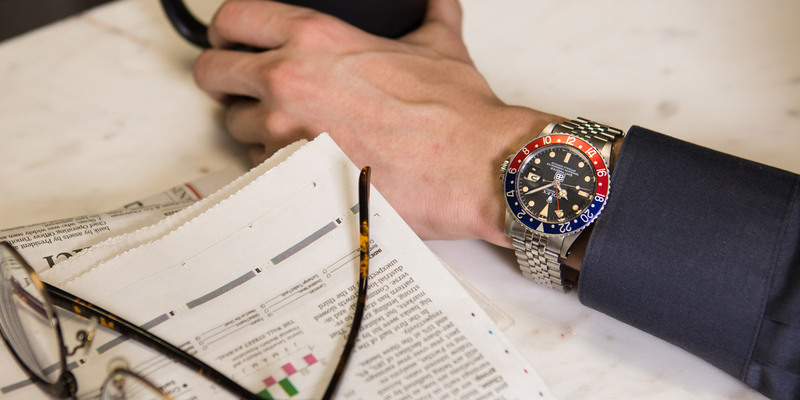 The bezel, that most recognizable of attributes with its iconic blue and red Pepsi color scheme, has been replaced at service and gives the watch a look almost as pristine as when it was made nearly 40 years ago. 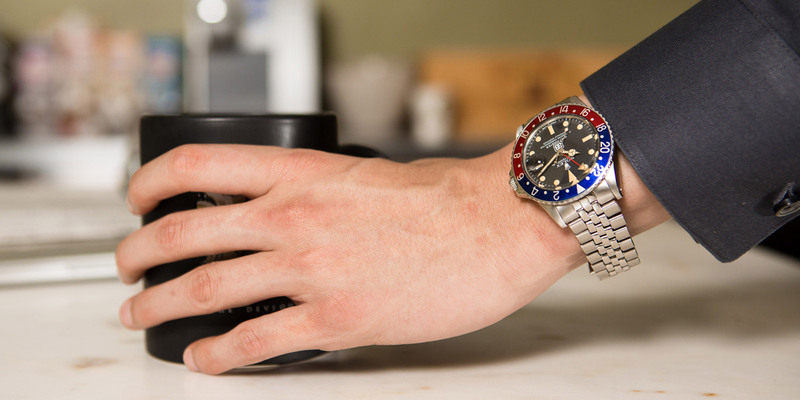 The aluminum insert superseded the former Bakelite surround at the start of the GMT’s second generation. Inside, the Cal. 1575 was one of Rolex’s first series of fully in-house calibers, replacing the Cal. 1565 of the earlier models and upping the balance frequency to 19,800vph as well as adding a hacking feature. The AB logo is from a trucking company. And so to the dial. The ref. 1675 was fitted with a glossy, or gilt, dial for the first few years of its life, as were all of Rolex’s sports models. These Mark I faces also had gold text and markings, along with a chapter ring on the very earliest examples. From the mid-sixties on, the company switched to matte dials as we see on our Mark IV example from the seventies, and the tritium-filled indexes and hands have aged to a beautiful cream. A pilot’s watch it may be, but its legendary toughness and resilience make it a logical choice to present as recognition for the demands of the haulage industry. It gives this 1657 a rarity value that cannot be underestimated, a hugely desirable piece of Rolex history, ranking alongside the likes of the COMEX Subs. 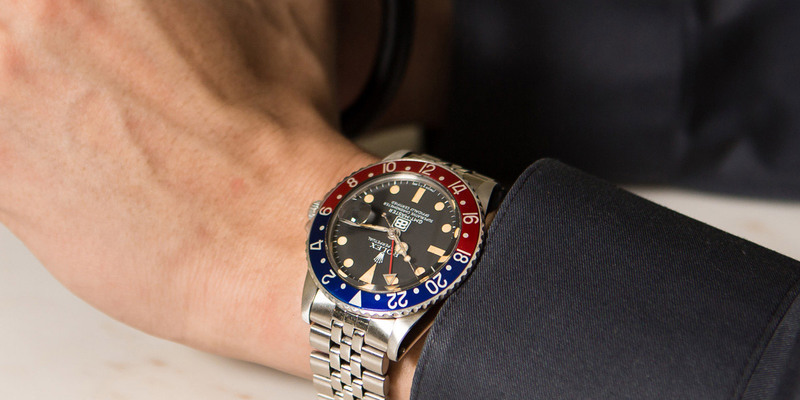 What are your thoughts on the GMT 1675? Twin name Rolexes are scarce on the vintage market; the crown very rarely allows another company to share dial space with their own name. Finding one in a condition as immaculate as our ref. 1675 GMT-Master is something that doesn’t happen every day. For serious collectors, as well as those who appreciate the very best, head over to our online store to check it out.